White Gold, just the facts. White Gold : the facts. What is white gold and how does white gold differ from platinum? What is palladium? Gold itself is a pure element and is naturally yellow. It is also soft, too soft to hold up in jewelry. We need to alloy it - that is, to mix it with other metals to make it harder and more rigid for use in jewelry. Pure gold is 24 karat and, in an alloy, the parts out of 24 that are gold are said to be it's karat. So 14 karat gold is 14 parts gold and ten parts other metals or 58.5% gold. To make karat alloys of yellow gold, the other metals are silver and copper, a mixture which retains the yellow color. To make white gold, nickel or palladium are primarily used instead of the copper and silver blend. This makes the metal white, while the gold content lends it's tarnish resistant quality to the mix. The gold is still present in the same proportions as denoted by the karat mark. In both yellow and white gold alloys, small amounts of other metals such as zinc are also present to improve workability and casting quality. Nickel white gold versus palladium white gold. 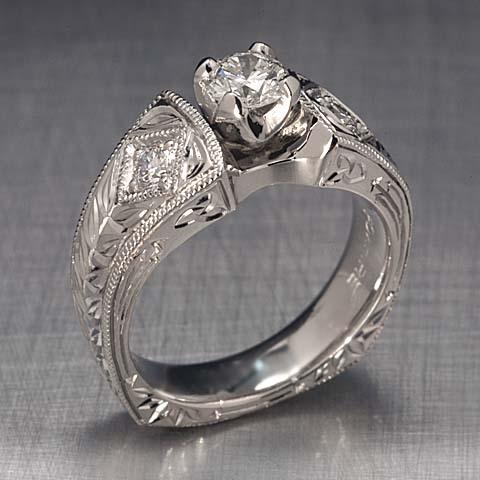 Some people have an allergy to nickel which may result in a rash when wearing nickel white gold. In this case we can use palladium white gold which is white gold alloyed with palladium, a platinum group metal. Where nickel white gold alloys are slightly yellow, palladium white gold alloys will be slightly gray. Again we are using a special alloy which is whiter than average. In the end, the whitest nickel white gold is whiter than the palladium white gold currently, but new palladium white gold alloys are in development and we will use them if they prove to be better. Platinum is a rare, pure precious metal that is naturally white in color. It is alloyed with iridium, cobalt or ruthenium to increase it's hardness for use in jewelry. Compared to white gold it is visibly subtly whiter. It is also more costly for several reasons: It weighs more than gold (so a ring will weigh more), the alloyed metal contains 90-95% pure platinum where 14 karat gold is 58.5% gold, and the metal price itself is more. It is also more difficult to alloy and cast. Platinum metal and parts end up costing us about five times that of gold. Labor however, while more than with gold, is not five timesmore, so the cost of a finished custom piece in platinum will be approximately three times that of a white gold one. Another aspect of platinum is durability. Because platinum is actually softer than gold alloys it has excellent resistance to wearing away in jewelry. On a microscopic level, platinum dents instead of chipping off like white or yellow gold. While this makes platinum very durable it also means it dulls more quickly in wearing. Palladium is a platinum group metal that acts alot like platinum itself, but is lighter weight and less expensive. It is hypo allergenic, sturdy, long wearing and naturally very white. It was used extensively during World War Two, when Platinum was scarce, but jewelers kind of forgot about it. It offers an excellent choice for jewelry as it's workable and beautiful. The Palladium alloy used at Foxfire is 95% Pure. at the left Palladium and 18K Yellow ring, Hand engraved, with Red Spinel. Some jewelry manufacturers and even custom jewelers, faced with white gold alloys that are anything but white, resort to electroplating their jewelry with rhodium. This is a platinum group metal that is not used in it's solid form, but only in plating. White gold items which have been rhodium plated pose problems in repair because the plating can bubble or flake when exposed to heat (soldering, sizing.) As the jewelry gets scratched and dull, it cannot be buffed without removing the plating, which requires sanding and complete refinishing. This can be problematic around prongs and in detailed areas. Leaving the old plating can result in a line or seam showing. At Foxfire Jewelers we avoid rhodium plating whenever possible which is why we have taken the effort to use white gold alloys that are as white as possible. These alloys require more care and expertise in casting, but we think they're worth it.